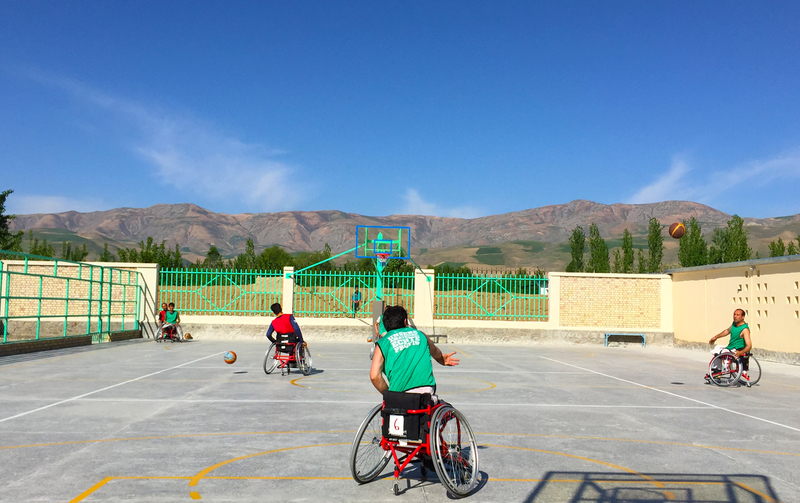 Afghanistan Wheelchair Basketball Project | Jess Markt's travel journal. 2019 is off to a great start. My first coaching trip of the year was a two week visit in February to the Democratic Republic of the Congo (DRC). It was my first time working in the country, though I had coached two of its players and trained one of its coaches in Ethiopia last November as part of a regional training program. I was excited for the chance to experience another new culture, see a part of the world – Central Africa – that I’d previously only known through books and news stories, and help a wheelchair basketball program in its relative infancy start to take its first steps. I spent the first week of my stay in Kinshasa, the capital of the DRC. The city is situated in the west of the DRC on the bank of the Congo River – the world’s deepest and second largest river – directly across the border from Brazzaville, the capital of the neighboring Republic of the Congo. In terms of area, the DRC is the second largest country in Africa – just slightly smaller than Algeria – and is the 11th largest country in the world. Kinshasa is estimated to have a population of around 13 million people and is the famed site of the Rumble in the Jungle, the 1974 heavyweight boxing title fight between Muhammad Ali and George Foreman (back when the DRC was known as Zaire). Our wheelchair basketball training took place on the campus of the city’s Olympic Stadium, not far from the site of that legendary sporting event. When I arrived on the first day of training, most of the players were already there, in their basketball chairs, ready to play. This may seem like a normal expectation to some, but I’m not sure I’ve ever started a practice in any country on time, so I was impressed right away. The 20 player group I worked with that first week included an even split of men and women from Kinshasa and Kisangani (a smaller city in the north of the country) and they were all eager to get started. The group included two players – Rosette Luyina and John Mwengani – who had competed as wheelchair racers in the 2016 Rio Paralympics, and it was clear right away that, no matter how early the Congolese players were in their development as basketball players, there would be no shortage of athleticism from which to build. We had an outstanding first three days of training, with the players putting all their energy into learning and perfecting basic individual and group skills. On the fourth day, it had rained hard throughout the night and into the morning. The rain seemed to be subsiding just in time for practice, though, so we all took brooms and squeegees and did our best to clear all the standing water off the court. After about 45 minutes, it was dry enough to play, so everyone started getting in their basketball chairs. At that moment, I looked up and saw that, while the clouds were largely broken in all directions, there was one menacingly dark bank off to the west. I asked one of the coaches which way the weather normally travels in Kinshasa. Naturally, he pointed right to the black cloud. I told everyone to put the wheelchairs back in their storage room as quickly as possible. We started pushing, limping and hobbling across the campus just as the rain started to fall again, all 30 of us (including coaches and referees) gathering under a huge stone staircase on the outside of the stadium just as the skies opened up. We spent the next three hours with me verbally explaining the concepts we were supposed to have learned on the court that day, then opening the impromptu session up to questions from the players. At first no one wanted to ask anything, but once the first player – Rosette the former racer – got the courage to ask one, the floodgates opened and I ended up answering dozens of great questions about all aspects of the game. The rain pounded the stadium above us the entire time, but we made the most of the situation. It was a very special bonding experience for all of us. Each day, following the conclusion of four hours of on-court practice, I would teach introductory classes for coaches, referees and classifiers. The classroom was the office of the president of the Congolese National Paralympic Committee, Professor Betty, who struck me as the perfect leader for an up-and-coming program like the one in DRC. She’s smart, humble, well connected, and truly cares about the players. She even learned the basics of wheelchair basketball refereeing and classification as one of my classroom students in order to be more closely tied to the sport as it grows across the country; I’m pretty sure that’s the first time I’ve ever taught a university professor. One factor that contributed a great deal to the success of both the on-court and classroom trainings was the work of my English-to-French translator, Ken, a 23 year-old who was born in Kinshasa but who spent his late teen years in Johannesburg, South Africa, where he learned to speak fluent English. Ken had played a little basketball in his youth, but was – and continues to be – a very good football (soccer) player and runner. The work he did interpreting for me reawakened his love for basketball, though, and he told me many times that he wanted to stay involved with the wheelchair basketball program as either a coach or an administrator. I told him it would be a great thing for the DRC program to have a young, motivated contributor like him. Before the end of the training, he committed to join the Congolese Wheelchair Basketball Federation and asked if I would be willing to continue mentoring him from afar so he could learn as much as possible in order to help the sport grow in his country. He’ll have the chance to do great things, I have no doubt. One consistent theme among all the countries in which I’ve coached: everybody loves selfies. Here I take one with Muamba from Kinshasa. The coaching, classifying, and referee students and I had a surprise visitor on our second day of class when we were joined by Tony, a Spanish national, who was driving – by himself – from Spain to South Africa then up to Russia to promote the power of basketball to bring people together and heal societal wounds. He even named his project after my old home town, Brooklyn. Following my week in Kinshasa, I flew across the country to the shores of Lake Kivu – which forms the border between the DRC and Rwanda – to the city of Bukavu. I was joined on the trip by Professor Betty, Firez, the vice president of the Congolese Wheelchair Basketball Federation, and Eva Bonjele, an ICRC colleague who is responsible for the disability sport and inclusion component of the ICRC Physical Rehabilitation Programme in the DRC. After six hour flight – we had to fly north to Kisangani to drop off the players and coaches who had come to Kinshasa for the training camp before flying southeast to Bukavu – there was a 20 mile (32km) drive from the airport to the city of Bukavu. Normally that drive takes somewhere between an hour and an hour and a half because the road (there is only one) is in very bad condition for much of the journey. We arrived following several days of heavy rain, so the road was a massive mud pit in many areas, which causes several giant trucks to get stuck, blocking the way. It took us four hours to drive 20 miles, which made for a long travel day, but it gave me a chance to observe how life works on a daily basis in Eastern DRC. I was stunned by how many people there walk for hours every day to get to and from work, to the market, or running other errands – often carrying huge loads with them either on their backs on balanced expertly on their heads – through extremely difficult muddy conditions. Despite this, I don’t remember seeing a single face looking forlorn, angry, or unhappy. I’ll definitely think about all the commuters in Bukavu the next time I get stuck in a traffic jam in my comfortable, temperature-controlled car and am tempted to complain about what an inconvenience it is. The other positive aspect of the long drive was that I had the opportunity to appreciate all the natural beauty the Congo has to offer. I didn’t get a real sense of the country while I was in Kinshasa – most giant cities tend to feel fairly similar to me – but driving just the 20 miles through South Kivu province from the airport to Bukavu allowed me to see what I’d always imagined the country looking like. It was even more beautiful than I expected, with the lake and dramatic weather systems combining to create amazing vistas that constantly shifted throughout the day. The court where we held the training camp was perched high on a hillside overlooking Lake Kivu, with the city of Bukavu on the near shore and the rolling hills of Rwanda across the water. It was right up there with the court in Faizabad, Afghanistan as the most naturally beautiful settings in which I’ve ever had the opportunity to coach. The players and coaches, classifiers and referees in Bukavu were just as wonderful as their counterparts in the West of the country. Again, the group was split evenly between male and female players, half from Bukavu and half from Goma – a city in North Kivu Province on the opposite side of Lake Kivu. The Goma players and coaches traveled four hours by boat across the lake to spend the week in Bukavu, an experience I wished I’d been able to share with them. I was originally scheduled to conduct the eastern training in Goma, but some security issues shortly before I arrived forced us to move the training to Bukavu. I was very impressed by the organization and – again – timeliness of every training session considering how quickly it had to be thrown together. I can’t thank the Wheelchair Basketball Federation, National Paralympic Committee and my ICRC colleagues, Eva and Bernardo, enough for all their hard work to make it happen despite all the logistical challenges. During the three days of training in Bukavu, I shared lunch with a different table of players each day. With the help of my two interpreters, Peter and Oscar, I was able to have some very interesting conversations. One question that really struck me was when Felicité, an 18 year-old female player asked me, “how are you treated as a disabled person in your home country?” I’ve heard variations of this question from players a time or two before, but it always makes me stop and think how I can respond as authentically as possible while being respectful of the vastly different cultures and socio-economic realities in which the players and I are living. I told them that I try not to be particularly concerned with how people perceive me or if they have negative or misinformed assumptions based on my physical appearance. I said that I made a decision when I was first injured over 22 years ago that I would act and present myself as the person I know myself to be. While having a physical disability is certainly something that is an important part of my daily life, it is never what defines me. I choose to let people see the bigger picture of who I am in the way I interact with them and the way I carry myself. The players at the table, all of whom were between 17 and 21 years old, looked at me with their eyes wide open and shining. They asked, “Is it possible for us to do that too? ?” Of course it is, I told them. Even if you are dealing with a society that may be a bit less evolved in how it is accustomed to perceiving persons with physical disabilities, the only way for that to change is for you to display the strength, intelligence and beauty that each of you have inside you and push to achieve your dreams so everyone you meet can see what you are truly capable of. That is the only way for a truly inclusive society to evolve. You can be the ones to start that change. They all nodded and smiled confidently. “We will do it,” they said. I know they will, and I know the DRC is about to see its wheelchair basketball program truly blossom. In late October, Joe Higgins, former head coach of the Canadian and Hong Kong men’s national teams and one of the world’s legendary wheelchair basketball teachers, and Alphonsus “Fonzie” To, a member of the Hong Kong national team and a resident of Vancouver, Canada who has played for multiple wheelchair basketball teams coached by Joe in Canada, the U.S. and Hong Kong, traveled together to Chennai, India to conduct a training camp for Indian men’s national team hopefuls as well as a group of young developing players from across the country. I met Coach Joe while coaching the Afghanistan men’s national team at the IWBF qualifying tournament for the Asian Para Games this past March in Bangkok, and was immediately impressed by the progress he’d made with the Hong Kong team since I’d seen them just a few months before at a tournament in Beijing. Recognizing his ability to quickly identify the strengths and weaknesses of teams and individual players, as well as his knack for providing them with a roadmap to success, I invited Joe to travel to India as a consultant to the ICRC to work with both elite and beginning athletes and coaches for a week and a half. Fonzie – whom I’ve gotten to know well through Team Canada, Team Hong Kong, and the NWBA here in the U.S. – volunteered to join Joe as an assistant coach. I knew Joe and Fonzie would be a perfect team to help India take the next big step forward in its wheelchair basketball development, so I was excited to send them as the first coaches I’ve ever deployed through the ICRC other than myself. I asked Coach Joe to write a guest blog post about their experience, which he graciously agreed to do. Thanks to both Joe and Fonzie for their incredible work! Let me begin by thanking Jess Markt for the honour of being a guest contributor to his blog. As 2018 draws to a close, I wanted to write about the awesome experience Alphonsus “Fonzie” To and I had coaching in India this past October and November. Jess, as many of you know, has shown great leadership and vision in inspiring many developing nations to build wheelchair basketball programs in recent years through his work for the International Committee of the Red Cross (ICRC). Fonzie and I were excited when we were asked to run a camp for the Wheelchair Basketball Federation of India (WBFI). This federation is led by President Madhavi Latha and, through her leadership and hard work, India has shown great growth and development in the sport. Working with Jess, the ICRC and the WBFI, Madhavi organized a camp that integrated high performance players from across India, developing performance players from different Indian states, and young future players who will be the foundation of the sport for years to come. An additional component of this camp was the inclusion of a coaching mentorship program which brought together many fine coaches from across India. The clinic in India had many highlights, but my most impactful realization was how much this program has grown in just four short years. The number of quality players, coaches, and administrators who are working together to develop wheelchair basketball in India is amazing! The players showed daily improvement throughout the camp in all aspects of wheelchair basketball: tactical, technical, physical, and mental. The players showed a great ability to help each other improve, always displaying kindness and openness to learning from each other and the coaches at the camp. Each morning, the camp would begin—sometimes as early as 6am—and we would break the players into groups with different themes for their development. And although we only had two hoops, we used the gym highly effectively by breaking it down into segments. Fonzie would take athletes and work on certain skills; myself and other coaches would do chair skills and passing skills in another area of the gymnasium; and another set of coaches worked on team play at the other end of the court. One of the coolest things was watching the future young players of India come early every morning to watch the best of India perform these skills. Each session was broken down into two hour segments. When the future players of India took the court, it was a challenge for all coaches at the camp to make it enjoyable, rewarding, and challenging for every participant. And they did an excellent job building relationships and bringing out the best in every athlete. I believe that India has many strengths and challenges ahead. They have many high quality coaches who have deep experience in stand-up basketball as well as several coaches who have had experience in wheelchair basketball. As they learn to integrate their strengths as coaches and people, they can make each other strong wheelchair basketball coaches. Their knowledge and willingness to be coached as they develop was evident every day. Madhavi and the WBFI’s secretary general, Kaylani, have developed a culture of giving back through their leadership. It was evident in the coaches, the volunteers and the man they called the Chair Doctor, whose job it was to make sure that the equipment (and Coach Joe) was well looked after. Throughout the camp, the players and coaches were exposed to different types of practices and coaching methods. These included “Jamboree” games where all the players of the camp played in big scrimmage games where each team had many players of all different levels. They played with and against each other in a fun and competitive environment. The positive impact such games will have on the young players – who had their first chance to play with the country’s best athletes – will be demonstrated in the years to come. We also ran special sessions focusing on positional drills and classification-specific tricks of the trade. As the camp progressed, coaches and athletes became more involved in mentoring and helping each other execute drills and skills. The players and coaches of India take great pride in defining themselves as athletes and individuals who can overcome the challenges that come with playing and developing this relatively new sport in India. Some of the challenges for me and Fonzie seemed very big at first. Coming from Canada, which has a long and rich wheelchair basketball history, we are used to having access to top quality equipment including wheelchairs, strapping, basketballs, and wheelchair accessible basketball facilities. In India, things were a bit less refined in this regard as the program is still in its early stages, but we all made the most of what we had. These challenges will be addressed over time, but the participants and organizers of the camp and people like Jess will focus on what they can do today and how they can improve things for the future. An example of this is the ICRC tournament that was held in Lebanon shortly after Fonzie and I ran our camp in India. Here five developing national teams from countries dealing with war and conflict came together to compete through the support of the ICRC. Tournaments like this help nations who are new to the sport develop and measure their strengths and weaknesses while providing the players and coaches with invaluable international competition experience. India came home with a third place finish, making its country proud, and showed great improvement from its previous international competitions. The experience in India for Fonzie and me was much bigger than a basketball camp. It began with a welcome dinner and many “selfies” with players and coaches who would become our friends. I am not known to be very good at remembering names and with 60 new friends it was imperative for us to come up with nicknames—Mosquito, Magic and Beast, to name just a few. The calls of “Coach!” echoing around the gymnasium as players constantly tried to get Fonzie’s attention for another tip or another photo is a memory I will not soon forget. On the final day, the WBFI put on a fabulous exhibition of wheelchair basketball for dignitaries and current and potential corporate sponsors where she recognized players and coaches with gifts and awards. This is just one example of how India is promoting wheelchair basketball as a premier sport across the country, with points of engagement for all different sectors of society. This type of inclusive thinking will help the sport develop extremely quickly. As I left the gym on our last day, I looked back and saw one of the WBFI’s finest volunteers, the Chair Doctor, solitarily loading the last of the basketball wheelchairs into a big cube van. He represents all those who helped make this experience happen for Fonzie, me and all the Indian players and coaches. Thanks, Jess, ICRC, WBFI, and all those who worked behind the scenes to put on such a great experience. If any of you coaches around the world ever have the opportunity to work under Jess’s inspiring vision, I would encourage you all to say YES! I always say wheelchair basketball is a family and with leaders like Jess Markt, the family will continue to grow and become stronger. From November 29th to December 1st, the ICRC held the first annual Hanna Lahoud International Wheelchair Basketball Cup – its first ever international wheelchair basketball tournament – in Tripoli, Lebanon. The Cup was intended to be an opportunity for players in West and Central Asian countries receiving support from the ICRC Physical Rehabilitation Programme (PRP) to come together and demonstrate their skills and the power of sport to stimulate the inclusion of persons with physical disabilities, even in some of the most challenging places in the world. Teams participated from Afghanistan, India, Iraq, Lebanon and Syria. It was a fantastic event that generated some incredible stories as well as powerful friendships among the various participants. Hanna Lahoud, for whom the tournament was named, was a Lebanese-born ICRC delegate who was tragically killed in the line of duty in April of this year while serving in Yemen. While I never had the opportunity to meet Hanna in person, we share many common friends and I know he was a universally beloved colleague who brought great joy to all those who had the good fortune to pass through his orbit. Hanna was also a great fan of wheelchair basketball. He even organized – and played in – regular pickup games in Guinea Bissau, where he was posted before moving to Yemen. He was personally dedicated to pushing for the social inclusion of people with disabilities during his life, and I can’t think of a better namesake for what will hopefully become an annual ICRC event. Thank you to Hanna for everything he contributed and for all the lives he touched. His legacy will continue to impact many more. I was excited to see the team from Afghanistan, with which I was supposed to have spent two weeks in late September before my mission was canceled at the last minute due to security issues. Not having been with them in person since I coached the team at a tournament in Bangkok, Thailand last March, I was excited to see how they’d grown in the months since. This would be the first tournament in which the Afghan men’s team has ever participated where they weren’t entering as massive underdogs (all their previous international experiences have been at Asia zone-level qualifiers with elite teams like Australian, Iran, Japan, Korea, etc. I also chose this as the first tournament in which I wouldn’t act as the team’s coach. Given that it was the first ICRC tournament and my role is to support the development of sports programs in all the countries where we work, it felt like I should be an unattached supporter of all the teams, so I handed the coaching reins over for the first time. Qawamuddin Ghafoori, my long-time assistant coach with the national team, would take over as head coach, and the team captain since its inception four years ago, Wasiq Sediqqi, would transition from player to assistant coach. I was confident in Qawam and Wasiq to lead the team in the right direction, but was curious to see how they would respond when faced with inevitable adversity. Not surprisingly, it was a very strange feeling to sit in the gym watching as a team I’ve coached in every game they’ve ever played took the court without me on the bench. There have been less than a handful of total wheelchair basketball competitions – in any country – where I haven’t been a coach or a referee, so it felt a bit awkward to not have a clearly defined role (thankfully the classifiers invited me to join them so I wouldn’t go completely stir crazy). During the first game of the tournament, in which Afghanistan played a solid Iraq team (not the national team of Iraq, but a very strong group of promising young players) I found my heart pounding the same way it had during every game in which I’ve coached them in the past. I tried to create some emotional distance – I was rooting for both teams equally, right? – but it was difficult. After Iraq took an early lead, the teams went back-and-forth for the second and third quarters. I continued to sweat. Finally, in the fourth quarter Afghanistan hit its stride and pulled away. The Afghan coaches did a great job running substitutions to keep their players fresh, which had the team playing its best in the latter stages of the game. I have to say, though, better even than seeing the team play well and get a win to start the tournament was the way they all comported themselves during the game. They were perfect gentlemen even during the most intense parts of the game: reaching out to tap an opposing player on the shoulder if they fouled him, helping Iraqi players up if they fell out of their chairs, behaving respectfully toward the referees even if they didn’t agree with all the calls. It warmed my heart to see them playing well, but also playing the right way and exemplifying the ideals of the tournament itself. I was similarly looking forward to seeing the Indian team play for the first time since Thailand – which had been their first official IWBF tournament; always a huge challenge – and catch up with the players I had coached back in 2014 and ‘15 when they were first getting started. India had a new head coach in Lebanon as well – Sharad Nagane, who was among my first group of Indian coach trainees when I visited the city of Pune in 2014 – who joined longtime assistant coach, Thayumana Subramaniam, in leading the team. Team India was coming off a training camp conducted by coaches Joe Higgins from Canada and Alphonsus “Fonzie” To from Canada/Hong Kong, whom I’d sent to India in late October to give the team a dose of their significant international experience and knowledge. The training camp went fantastically well, by all accounts, and I was excited to see what new skills and coordination the team would bring to the tournament and observe how Sharad and Thayumana would shepherd them into the next stage in their development. The Indians played Syria in their first game and, while they looked infinitely better than they had just seven months before in Bangkok, their consistency hadn’t yet caught up with their newfound understanding of the game. Syria – which, to my understanding had never played together outside Syria before – played its heart out and never let up the pace, holding on at the end for a close victory. I talked to the Indian coaches after the game and told them to focus on keeping their team’s confidence up. They had shown that they were capable of playing at this level – I actually felt they played a better game than the Syrians; they just couldn’t knock down the shots they needed – and needed to retain that focus in the coming days to show the rest of the tournament field the kind of team they could be. During the remainder of the tournament, the games got better and more competitive as the teams settled into their respective grooves. Afghanistan managed to win each of its four round robin games, sending it to the championship match on Saturday afternoon. The other four teams showed great parity, splitting games between each other and coming down to the final round robin game to decide which position each would play for on the final day. In the last game of the round robin, India managed to eke out a one point victory over Iraq to secure its place in game for third place. Finally putting everything together and using strategy and technique to pull out their first close win in international competition was massively cathartic for the Indians, and they were absolutely glowing after the game. They carried that energy into the third place game and dominated from start to finish to win the tournament’s bronze medal. It was the first step in what I know will be a rapid rise for that team. Syria, following the aforementioned win against India in its first game, managed to win enough to punch its ticket to the championship game against Afghanistan. Syria may not have been the most technically proficient team, but they definitely had the most heart. They were led by Nabih Chabaan, a class 4.0 who played like a wheelchair basketball version of Charles Barkley – not the tallest or fastest player on the court, but one of the strongest and one who always found a way to convert baskets when his team needed them. Syria fed off Nabih’s energy and leadership and played at the top of their capability throughout the tournament. The other player on the Syrian team that most astounded me was Laith Mubayed. Laith is a class 1.0 player who has overcome some of the most challenging impairments I’ve ever seen in a wheelchair basketball player. He was born with very short legs – so short his feet barely reach the edge of his wheelchair cushion – and his arms are truncated just above each elbow. This means that Laith pushes his wheelchair (quite fast, I should point out), dribbles, passes and shoots with no hands and no forearms. During warmups, he was shooting – and making – three point shots. I’ve never seen anything like it in all my years in the game. To shoot a ball any distance using two biceps seems almost impossible. To shoot it over 22 feet (6.75 meters) with accuracy is just completely unbelievable. Laith was at the center of the Syrian team’s energy whether he was playing ferocious defense in the game or cheering from the bench. He would get so fired up between plays on the court that he’d bounce his wheelchair up and down, jumping all four wheels off the floor. The concept of a player being “an inspiration” starts to become redundant in a wheelchair basketball tournament peopled entirely by physically disabled players coming from countries dealing with war and conflict, but Laith definitely inspired everyone who saw him play. I can’t wait for the rest of the world to meet him once Syria’s national team starts to play in international tournaments on a more regular basis. A quick aside: Lebanon as a country is crazy for basketball – maybe the only place I’ve visited outside the US where basketball is more popular than soccer. They have a high-level pro league in which the star players are national celebrities similar to NBA players here in the US. The communications team at the ICRC delegation in the capital city of Beirut managed to convince several of the best players in the country – all members of the Lebanese national team – to support our tournament by both participating in online ads beforehand to build public awareness and excitement and by playing in an exhibition game in wheelchairs against some of the players on the Lebanese wheelchair team preceding the tournament final. I had the pleasure of coaching the able-bodied stars during the game, which meant I had approximately 30 seconds to explain how to move their wheelchairs while controlling the ball before they hit the court in front of a raucous crowd. The players were great sports and threw themselves fully into trying to get the hang of the game on the fly. After a few minutes of being run off the court by the Lebanese wheelchair team – and falling behind 10-0 – they started to get the hang of it and brought their shooting and height to bear in mounting a comeback. In the end, one of the able-bodied players buried a three pointer to tie the game at the final buzzer, sending the crowd (and his teammates) into pandemonium. The tie score was a perfect way to end a game that was all about equality and inclusion. The players graciously took photos with anyone who asked following the game. It was a wonderful experience for everyone – hopefully they’ll be ready to come back next year! In the final game, Afghanistan and Syria played a classic. The gymnasium seats were packed with supporters from the ICRC and the community, as well as the family and friends of Hanna Lahoud. The game was played at a fast tempo throughout, with both teams reaching their highest scores of the tournament. Nabih scored 28 points for Syria, keeping them in the game until the end against a balanced scoring attack from Afghanistan. When the final buzzer sounded, the Afghans had preserved one last victory and collapsed into a pile of tears and laughter – a team that had never won an international game until earlier this year was now the tournament champions. It’s easy to forget sometimes in the endless swirl of training camps and competitions what a rare and beautiful thing victory can be. Not a single member of the Afghanistan team has lived a day of their lives without the specter of war looming over them. They have all embraced wheelchair basketball as their salvation. This was finally the (first) culmination of all the hours they’ve spent working diligently to learn a game most of them had never seen before they first picked up a ball a few short years ago. Watching them spread their wings and achieve this victory together was a wonderful, but admittedly slightly strange, feeling. I wanted nothing more than to embrace each of them and tell them all how proud I was of them, but I knew that I needed to hold back – at least for that moment – and let them feel the power of having done something very powerful all on their own. The final moment of the tournament was the presentation of the award for the most valuable player by the Hanna Lahoud Foundation. The Foundation was formed recently by Hanna’s wife, Patricia, who also works for the ICRC and whom I’d gotten to know during my last visit to Afghanistan in February, and several family members and close friends of Hanna’s. The Foundation’s first act was to raise money that would be given to the MVP to help them get an education, start a business or develop another project designed to either generate income or improve their community. The MVP was voted on by each of the coaches with the instruction that their choice should exemplify not only impressive skill on the court, but also excellent sportsmanship and leadership (the coaches were not allowed to vote for their own players). When the votes were tallied, the player who stood above all others was Nabih from Syria. When he heard his name announced, his hands flew to his face and he dissolved in tears of joy. I don’t know much about Nabih’s story – though I hope to learn more in the coming years – but I can only imagine the journey he’s been through during the last several years in Syria. He definitely earned that award. Endless thanks to everyone at the ICRC in Lebanon, the Hanna Lahoud Foundation, the Tripoli Disabled Sports Association, and the other partners who helped to make this tournament happen. It was a perfect representation of what the ICRC’s sport and inclusion program is all about and was a true credit to Hanna’s legacy. Until next year. Addis Ababa, the capital of Ethiopia, hosted a group of top ambassadors from neighboring countries in the African Union over the last couple weeks. At the same time, the ICRC Physical Rehabilitation Programme (PRP) in Addis brought together a diverse collective of wheelchair basketball players, coaches, referees and classifiers from across five East African countries, along with guest educators from South Africa, Turkey, Switzerland and, in my case, the U.S. It’s been a phenomenal two weeks filled with innovation, friendships old and new, lots of languages and a tremendous amount of positive energy. After arriving from South Sudan on November 11th, my first order of business was to meet up with Cynthia Hansen, head of the Adecco Group Foundation – the Zurich-based ICRC Corporate Support Group Partner that is providing invaluable support as we build our global sport and inclusion program for persons with physical disabilities – to deliver a pilot project focused on teaching disabled athletes how to identify potential careers and acquire fulfilling employment. The Adecco Group has spent years supporting Olympic and Paralympic athletes in making the transition from full-time athletic pursuits to more traditional careers through their Athlete Career Program, so I’ve been working over the past six months with Cynthia and her Adecco colleague, Patrick Glennon, to tailor their training materials to apply to the types of contexts in which the ICRC works (less traditional economies, part-time athletes, differing views of persons with physical disabilities, etc.). The half-day pilot, intended to both give the athlete participants some valuable professional insights and get their feedback on how we can further hone the material to make it even more applicable to their lives, got our visit off to a great start. It was the first on-the-ground project we’ve done with Adecco and the first time the ICRC has delivered content of this type. After we gave a brief introduction about the purpose of the initiative, the 40 participants – many of whom were meeting each other (as well as Cynthia and myself) for the first time – became progressively more and more engaged and interactive throughout our four hours together. By the end, after the participants had shared some valuable perspectives on the material, I had several of them ask for the presentation slides so they could remember everything they’d learned. It was an extremely valuable exercise for us (and hopefully for them as well!) and I’m looking forward to working with Cynthia and Patrick to parlay the information we gathered into a 2019 global train-the-trainer program that will serve as the foundation for a further expanded and impactful ICRC/Adecco social inclusion initiative in the coming years. Following a great first few days spent with Adecco, I was joined next by two expert trainers from the International Wheelchair Basketball Federation (IWBF), with which the ICRC recently formalized a partnership that will allow us to bring IWBF technical expertise to bear in countries where the ICRC PRP supports burgeoning wheelchair basketball programs. Nurettin Bilmez, a referee instructor from Turkey who has been a top international referee for 20 years, and Loléta Krige, a classification instructor from South Africa with over 25 years of experience at the international level, came to Ethiopia as volunteers and provided tremendous educational programs for the gathered trainees. Like with Adecco, this was the first time the ICRC and IWBF have partnered to deliver training at the country or regional level, and it couldn’t have gotten off to a better start. I’ve taught classification and refereeing basics to trainees in many of the countries in which I’ve worked over the years, but Loléta’s and Nurettin’s level of knowledge and their ability to convey complex information to relative beginners in a way that could be quickly digested and applied really took this program to the next level. It also permitted me to focus my time and energy on teaching the players and coaches, which meant all the participants could dive as deeply as possible into their chosen field in a relatively limited time frame. I can’t thank Loléta and Nurettin enough for their contributions. Thanks also to the IWBF for the first of what I know will be many wonderful collaborations. There were too many incredible people gathered in Ethiopia to write about all of them, but I want to introduce some of the memorable characters in this African wheelchair basketball melting pot. We had players, coaches, and technical officials join the program from eight regions of Ethiopia as well as Rwanda, Tanzania, Sudan and the Democratic Republic of the Congo. Considering the range of languages and cultures represented and the fact that at least half of the participants had never met before, it was amazing to see the group laughing together like old friends just a couple days into the program. Nancy and Paulin were the two players to come from the DRC. They were joined by their coach, Teddy, and brought some serious competitive fire to the proceedings. The DRC has a fairly well-established wheelchair basketball program, with eight teams spread across the country. While this was their first official exposure to wheelchair basketball training, Teddy and a few of his coaching colleagues have clearly done their homework with the internet resources available to them. Paulin had the best technique and basketball mind of any player present at our camp and had a competitive intensity that was, in turns, both inspiring and intimidating for some of the other players. I had a few conversations with Paulin and Teddy (who provided English-to-French translation) about how Paulin needs to harness his competitiveness, intelligence and skill in order to become a true leader in DRC wheelchair basketball. The great news is that he proved to be an eminently coachable player who readily accepted constructive feedback, so I know he’ll take our talks to heart. He has the potential to become a legitimate international-level player after a few more years of development and good coaching. Nancy was a bit newer to the game and less polished than Paulin, but she had every bit of his competitiveness, balanced with an amazing sense of humor. She made the entire group laugh multiple times every training session with her antics and French trash talking – no one needed to understand the language to grasp her meaning. Nancy, like Paulin, is a natural athlete who listens well and has a great future ahead of her. I’m scheduled to make my first visit to DRC next year, so I’m excited to see how she and Paulin have evolved as players by the next time I see them. They’re both natural leaders who can be tremendous influences on their countrymen and women. The two participants from Tanzania were coach Robert and player Mariana. Robert immediately made his mark by being both an exceptional English speaker and one of the most engaged participants in the Adecco pilot presentation. Throughout the two weeks, he was constantly asking questions to ensure he completely understood every concept we learned. He has the perfect demeanor and attitude for a coach and I know he – and the Rwanda program – will go far if he sticks with it. Mariana, while not necessarily the most natural athlete of the group and definitely less firey than her Congolese counterparts (I think I heard her say less than 10 words during our two weeks together) was nonetheless one of the most dedicated students of the game. Every time I taught a new concept, she would do it again and again until she could fully grasp it, no matter how many times it took. This will be an invaluable trait in her imparting what she learned to the rest of the beginning players in Tanzania. Mariana also had one of the sweetest personalities I’ve ever encountered. No matter how hot it got or how hard I made her work, she always had a small smile on her face and – as a result – was loved by all the players. Rwanda was represented by coach David and player Dina. David has pretty extensive experience as a standing basketball player and referee, and proved to be a willing and talented coach of the wheelchair game as well. He was, like Robert, endlessly curious about the finer details of the techniques and rules of the game, and showed himself to be – both academically and on the court – a standout referee among a talented group. He could definitely become an international wheelchair basketball referee or coach if he chooses to pursue either path. Dina, like Mariana, started off the week quietly. She speaks English quite well, but I didn’t find that out until several days into the program. However, once she got comfortable with the other players, she opened up quickly and became a regular center of the action. At the end of our tournament on the final day of the camp, each foreign player was announced by the tournament DJ and was given a gift as a keepsake of their time in Ethiopia. When Dina was announced first to a pumping beat blaring from the sound system, she jumped out of her chair and launched into an Ethiopian-style dance that had the entire gathered crowd clapping and cheering. Dina rocks. While I’ve spent significant time in South Sudan the past two years, I had yet to meet a player or coach from Sudan in the north. Coach Adam and Marwan, the attending player, made an immediate and fantastic first impression for their country. Adam has a quick wit and is endlessly joyful to be around, and has a clear dedication to promoting sports for people with physical disabilities. He also proved to be an excellent referee trainee. I hope to support the new wheelchair basketball program in Sudan next year, but with Adam helping to get it off the ground, it’s in very good hands. Marwan – who doubles as a power lifter in addition to his more recent move to wheelchair basketball – will also undoubtedly be an important leader in the development of Sudanese wheelchair basketball. He was endlessly hilarious, commonly shouting his pleasure or displeasure with a given sequence in training or games in Arabic accompanied by wild gesticulations. He was just as willing to laugh at his own overwrought reactions, though, and got the biggest cheer of the entire group when he was announced last at the post-tournament gift-giving celebration. Marwan is the definition of the big teddy bear archetype – tough on the surface, but all heart. EthiopiaIt feels unfair to only write about two of the 25 Ethiopian players who took part in the camp, as they were all such great and individual personalities, but two of them – Emabet and Gizachew – stood out to me for very different reasons. Emabet showed talent as a player and had the demeanor of a natural – though still young – leader. She was just as quick to laugh or snap at herself for making a mistake, but she made real progress in the few days we had to work together. As the women’s game in Ethiopia continues to evolve, I can see her becoming a central figure on an eventual Ethiopian national team. Toward the end of the tournament, I noticed Emabet, Dina, and another Ethiopian player from a different region than Emabet all crying. I asked what was wrong and Emabet tearfully answered, “Dina is going home tomorrow and we are sad.” After just two weeks together and having only a handful of words in English with which to communicate, the bond these players developed is truly remarkable. It’s a perfect example of sport breaking down barriers and bringing people together. Gizachew came into the camp as a true beginner. I’m not sure if he had even held a basketball before our first day together, and his coordination was several steps behind the other players. He struggled throughout the camp to get his brain and body to work together as I taught the group progressively more difficult skills, but – similarly to Mariana – he never gave up. He just kept smiling and trying to get it right. Again. Again. Again. Gizachew never scored a basket in any of our practice games, and he played very few minutes in the tournament. However, when he found himself in the game at the end of the final game – his team behind by too wide a margin to come back – he was thrown a pass near the basket. He focused enough to make a difficult catch then, as the final seconds of the game ticked away, spun his chair to face the goal, raised the ball in the shooting technique he’d been battling to learn for two weeks and, as I whispered, “Come on, Gizachew…” to myself on the sidelines, swished his first in-game score ever. The entire gathered crowd of players and spectators erupted in cheers as a massive grin spread across Gizachew’s face. Gizachew is unlikely to become an international-level wheelchair basketball player for Ethiopia. He may never even play a primary role on his regional team. But that one meaningless (to most people) score in a makeshift tournament exemplifies the reason I – and everyone I am lucky enough to work with promoting sport and inclusion for people with physical disabilities – love what we do. Gizachew got a chance, even for a fleeting moment, to feel like a basketball star. Who knows; maybe that seemingly small experience will have a profound impact on his self-perception and the path his life will take moving forward. I would be remiss if I didn’t mention one more person who was instrumental in making this entire experience happen. Solomon Berhanu, a physiotherapist for the ICRC PRP in Ethiopia, spent endless hours coordinating logistics and making last second improvisations to get the equipment, facilities, transportation, and every other detail organized so that all of us could have an incredible wheelchair basketball training camp together. And he did all this while studying – and succeeding – to become a national-level classifier. Thank you, Solomon and everyone else who is helping to ensure sport for persons with disabilities in Ethiopia and across East Africa is a priority that will continue to grow and blossom in the coming years. The past two weeks in South Sudan have been some of the most memorable in the nine years I’ve been coaching wheelchair basketball in conflict zones (in fact, this past weekend marked the 9th anniversary of my first trip to Afghanistan – time flies!!). Because there were so many powerfully inspirational moments on this trip, I’m going to focus less on the basketball side of things in this post and more on the human element. As I mentioned in my posts about my first trip to South Sudan early last year, I felt a connection to the people there immediately after arriving. That feeling only got stronger on my second visit. One of the main drivers of that growing bond was the fact that I was joined on the trip by Malat Wei, a 24 year-old star player for the Arizona Wildcats of the NWBA who was born in South Sudan and moved the the US with his family as a refugee 12 years ago. Malat contacted me shortly after my last trip to Juba almost two years ago and asked if there was any way he could get involved in building the wheelchair basketball program in his home country in the future. He told me it had been his dream since he was first introduced to the game in Houston at age 14 to return to South Sudan and help people with physical disabilities create a league there. I was immediately struck by Malat’s dedication to creating something powerful for his people and his country – both of which he is intensely proud of – even though he hadn’t been back to South Sudan since his family fled war in the region when he was just three years old. Malat contracted polio as a child just before the family relocated to a refugee camp across the Ethiopian border. He didn’t have access to a wheelchair until he arrived in the United States almost a decade later. He spent his formative years at Dima refugee camp crawling on his hands and knees to get around, but never let that stop him from playing with his friends like any other kid. He played soccer with the local youth at Dima using his hands, and describes those days – hard as they were for his family – as some of the best memories of his life. Adding to the excitement, the day before Malat and I arrived, the opposing factions in the ongoing South Sudanese civil war – including former Vice President and rebel faction leader, Riek Machar, who had been in exile in Khartoum since the last major outbreak of fighting in 2016 – met to sign a major peace agreement. The ceremony, which was also attended by leaders from several neighboring African countries, went as well as could be hoped. Following a giant public celebration the night before we landed, the populace was buzzing with positive energy and hope for a better future for the world’s youngest country. The Juba International Airport Terminal – which had been under construction on-and-off for years – was even finally opened to commemorate the occasion; we were lucky enough to be among the very first people to pass through its doors. As we drove through the streets of Juba, Malat had his window open, taking in all the sights, sounds and smells of a place he’d never been, but that were still so familiar to his subconscious memory. “Look, that’s a mango tree!” he shouted probably five times in the first couple minutes after leaving the airport before realizing that mango trees – majestic as they are – are everywhere in Juba! It was magical to watch him take in all those familiar elements of South Sudan for the first time as an adult. He enthusiastically greeted people we passed in the streets from the window of the car, using the Dinka and Nuer languages he had learned growing up, and immediately ingratiated himself to every person he came into contact with. Whether on the court with the players or in the community, Malat was a positive force of nature during the entire trip. We broke the wheelchair basketball players into two groups of trainees. We spent the first three days working with 30 mostly brand new players, then the next four working with the experienced group – most of whom were the same players I’d coached in January 2017. The beginner group included the first female wheelchair basketball player in South Sudan – a slight young woman named Afaf – who was completely unintimidated by the fact that she was both new to the game and surrounded by 29 male players. To the guys’ credit, they treated Afaf as though there was no difference between her and them. The group was fantastic and Afaf showed herself to have the competitive instinct and personal drive to be the kind of leader we need to get women’s wheelchair basketball off the ground in South Sudan. My hope is that we can draw enough initial participants to join her that we can have a separate women’s training camp and game next year. Afaf is breaking new ground in South Sudanese wheelchair basketball, and doing it with a smile! We also got the chance to meet a South Sudanese women’s able-bodied basketball player and coach named Sarah Chan, who played college ball at the University of Tennessee and who is now based in Kenya. Sara told Malat and I that she would love to get involved with coaching wheelchair basketball in her home country as well, so we may have an even bigger coaching team next year. Having a role model like Sarah along with leaders like Afaf will undoubtedly have a huge impact on prompting more female athletes to take up the game. Those readers who were following my previous trip to South Sudan in 2017 may remember an amazing character named Peter “Bravo” Bol. Peter’s disability is fairly severe – it prevents him from leaning or turning in his wheelchair, making it very difficult for him to physically execute many of the skills we’re teaching the players – but his motor is far too strong to be slowed by such inconveniences. Bravo Bol does not take no for an answer, from his own body or from anyone else. One day, when a driver went to pick up Peter and his teammates at the UN Protection of Civilians (PoC) camp where they live outside Juba to bring them to the morning training session, the camp security guards said the vehicle wouldn’t be allowed to come inside. They also said the players didn’t have the requisite permissions to go outside to meet the car at that hour, leaving everyone staring at a likely delay in getting to the court for practice. Peter Bol would have none of that; he was ready to play. While the other players waited for the guards to look into the needed permissions, Bravo Bol grabbed his cane and, in his inimitable way, slowly strutted right through the gates of the camp by himself, dragging one leg behind him. The guards yelled at him to come back, but eventually gave up and allowed all the players to go out to meet the car. A few days later, Peter’s team, the Cobras, won the tournament championship while he played almost the entire game, bringing him up to two consecutive tournament wins in my time going to South Sudan. Peter Bol has been through a lot in his young life and he’s not interested in anybody telling him what he can’t do. Never change, Peter Bol! Another heart-warming story, unrelated to basketball, that happened during our time in Juba was a very special friendship that was formed between our wonderful ICRC communications colleague, Niki Clark, who accompanied Malat and I from Washington DC to capture photos and video of our journey, and a little boy named Dada who crossed the street from his family’s home to the basketball stadium every day to watch the action. Dada is three years old and has a warm, sweet personality. He immediately gravitated to Niki, and any time Niki wasn’t filming, taking photos, or directing other videographers, they spent playing together while our training was going on under the blazing Juba sun. Dada took to affectionately calling Niki an Arabic word that she didn’t understand. She assumed it was some sort of pet word like auntie or fairy princess. When she finally asked someone what it meant, though, they said it translated literally to “white person.” We all laughed about that for a long time. Literal or no, we all knew the affection with which Dada delivered the description was real. The second day after meeting Dada, Niki suggested that he run home to put shoes on, as the court was getting too hot to safely walk on barefoot. Dada left for a few minutes, but came back still shoeless. It was clear that he didn’t have any to put on. Later that day, he ripped a seam all the way down one leg of his shorts. He self-consciously tried to hold it closed and was clearly ashamed of his tattered clothing. Being the selfless person she is, Niki asked Dada’s aunt if it would be ok if she bought him some new clothes. After getting the ok from his family, she had our driver stop at a store selling toddler clothes and bought Dada a whole new outfit, including a truly incredible pair of mini sky blue Timberlands. Dada came to the stadium the next day and stomped proudly around the court, showing off his giant blue boots, new t-shirt and shorts. Thanks for making such a difference in that little boy’s life, Niki. And thanks, Dada, for doing the same for her. On the last day of training before we moved into our two days of tournament play, we were just leaving our hotel and driving toward the stadium in the morning when Malat pointed out the window toward a dirt side-road and said, “Hey! Look at that guy riding the handcycle over there! We should ask him if he wants to play ball!” Though we were already running a bit late and hadn’t, to that point, made a habit of hijacking random people as a recruiting tool, we asked our driver, Dennis, to turn the Land Cruiser around and go back to where the young man was riding. We pulled over and introduced ourselves. He said his name was Alex and he was 24. We asked him, “would you like to come to the stadium to watch a wheelchair basketball practice?” He said he’d never heard of wheelchair basketball, but that he’d like that. We had Dennis drop us off, then come back to pick up Alex and his hand bike. Malat noticed prominent callouses on Alex’s knees and hands and said he was sure Alex spent most of his time crawling around the same way Malat had when he was growing up in the refugee camp. They have nearly the same degree of post-polio impairment. It was almost like Malat was looking in a mirror at what could have become of his life if he’d never gotten the opportunity to come to the US. When Alex arrived at the stadium, we stopped practice to introduce everyone to him. All the players cheered the new arrival, and Alex’s grin was a mile wide. It turned out that the Motivation handcycle Alex was riding (which detaches to become an offroad wheelchair) was actually borrowed temporarily from a friend. He didn’t have a wheelchair of his own and, as Malat had correctly guessed, did the vast majority of his moving around by crawling. After practice, Dennis took Alex to the ICRC-supported physical rehabilitation center in Juba, where he was promptly given a wheelchair and handcycle of his own. Alex came back to the court each of the following two days and spent most of his time in my basketball wheelchair, either pushing around or watching the games with fascination. He’s now determined to become a wheelchair basketball player and the other guys are excited to have him join. Dennis, who lives near Alex, volunteered to take him to every practice. It was a good week for Alex. It was hard to say goodbye to all the players, coaches, and supporters, but the energy after the tournament was so positive that I have great hope for everyone’s progress. With Malat already asking when he can come back next, I can feel great things are on the horizon for South Sudan wheelchair basketball. Beezy, who is probably six inches shorter than me, challenged me to a wingspan contest. I think he’s got me. As I fly from the US to Africa for my first coaching trip in three months, I’m reflecting on the emotional rollercoaster that has been the summer and fall of 2018. I haven’t written a post since my July trip to Gaza, so I’m going to try to capture the key happenings in my world during that time, as well as teasing some of the current trip on which I’m eagerly embarking. One of the challenges my ICRC colleagues and I decided to undertake during my visit to Gaza was trying to get a team from Gaza to Lebanon in late November for the Hanna Lahoud International Wheelchair Basketball Cup, the first ever international sport competition organized by the ICRC (more on the tournament below). The players have been working hard for four years to improve and finally realize their dream of playing outside Gaza. We all saw this as a tremendous opportunity for them, though it was clear that the odds were stacked against it given the political reality Gaza is dealing with right now. Unfortunately, due to the extremely arduous timelines regulating the issuance of permits that would allow the team to travel by road through Israel to Jordan in order to fly to Lebanon, it was determined not to be possible this year. It was a blow for all of us, and I’m sure even more so for the players, but we will persevere and will continue to fight for a chance for the team to play abroad in the coming year. On the brighter side, soon after returning to the US, I began a conversation with my colleague, Ahmed Mosa, who leads the ICRC’s Physical Rehabilitation Program (PRP) in Gaza, and Simon Baker, one of the world leaders in promoting the sport of amputee football, about finding ways to support the fledgling amputee football league in Gaza. Simon had just wrapped up a project with the ICRC MoveAbility Foundation training amputee football players and building an administrative structure in Tanzania to great success. He was the first person I thought of when I was considering how best to give the new football program the best chance to succeed and grow. Ahmed and Simon hit it off immediately and agreed that we will set our sights on bringing Simon and possibly a second coach from the European Amputee Football Federation to Gaza in the first half of 2019. As the ICRC’s sport program continues to evolve, I’ll need to engage experts in sports outside my own purview, and working with Simon and the EAFF seems like a fantastic way to break into a new space for the first time. Despite the frustration of not getting the wheelchair basketball team to Lebanon this year, Gaza’s adaptive athletes have a lot to look forward to in 2019. In August, I was invited by the International Wheelchair Basketball Federation to attend the IWBF World Championships in Hamburg, Germany on behalf of the ICRC. Worlds, which are held every four years in between Paralympic cycles, are the biggest single gathering of elite national wheelchair basketball teams in the world, with 16 men’s teams and 12 women’s teams competing for the gold medal. It was a great chance for me to reconnect with many of the wonderful people I’ve been fortunate enough to get to know in global wheelchair basketball over the past several years, as well as meet with IWBF leaders to discuss how our organizations can work more collaboratively to enable the countries in which the ICRC is supporting wheelchair basketball programs to develop as fully and efficiently as possible. The competition itself was captivating, with the men’s and women’s teams from Great Britain both taking a huge leap forward in capturing the gold and silver in their respective tournaments. There were too many close games and surprise upsets to recount, but a young GB squad shocking the 2016 Paralympic gold medalists from the US in the men’s final definitely marked an explosive close to the proceedings. One of my personal highlights in taking in as many games as I could between meetings was getting to watch Riley Ljungdahl, a player I coached as a member of the Denver Lady Rolling Nuggets when she was just 14 and 15 years old, play for the Team USA women in her first major international competition. Riley’s mom, Karen, and I cheered proudly for her and her teammates as they fought their way through some very challenging games. The US women are in something of a rebuilding phase after taking home the gold medal at the Rio Paralympics just two years ago, but with a roster full of young players like Riley learning the international game for the first time, they’re building toward a very promising future. From a work perspective as well, the World Championships were a success for me and the ICRC. I had outstanding meetings with Norbert Kucera, the new Secretary General of the IWBF, and Steve Bach, its Vice President and head of development, that resulted in a memorandum of understanding being put in place that will see the ICRC and IWBF working closely together in developing nations to help the game continue to grow and thrive across the world. With the IWBF’s technical knowledge and the ICRC’s operational expertise in countries dealing with war and conflict, our combined programs are sure to make an even bigger impact on the players, coaches and technical officials with whom we work. Just two weeks after returning from Hamburg, I was set to fly to Afghanistan to coach and oversee men’s and women’s national tournaments during the latter half of September. In another dejecting turn of events, however, my visit had to be canceled at the last minute due to a particularly unstable security situation that made the ICRC uncharacteristically vulnerable. Everyone who reads this blog knows how important the Afghan players are to me – they have become like an extended family to me after 9 years working there – so it was devastating to get the news that I wouldn’t be allowed to go this fall. It’s only the second time I’ve had a planned trip to Afghanistan canceled in all this time, but with my travel schedule being so packed now, I knew it was the last chance I’d have to go this year even if the security issue resolved itself (thankfully, two weeks later, it did). One of my primary objectives on this visit was to help Coach Tahera Yousofi prepare the women’s national team for its participation in the Asian Para Games, for which it had qualified by finishing third in its regional qualifying tournament this past March in Bangkok, Thailand . The Para Games were held in Jakarta, Indonesia in early October, and would give the Afghan women their first taste of elite level international competition with teams like China (who finished fourth at the World Championships just a month before) and Japan on the slate. It was a shame that I wasn’t able to impart some lessons on competing against teams of that level in person, but we made the most of it by navigating a 13 hour time difference to conduct regular video chats between Coach Tahera, team captain Nilofar Bayat and myself to dissect completed games, work through challenges, and prepare the team for coming opponents. The team learned a great deal from the experience and – even though they had to face teams that were far more experienced and advanced then themselves for the first time – they fought hard until the end. The Cambodian women’s team, whom I coached when they were getting their start in wheelchair basketball back in 2014 and ’15, had also qualified for the Asian Para Games at the Bangkok tournament in March, and the two teams closed the tournament by playing against each other. Based on all accounts I heard, the Cambodians had improved dramatically in the six months since the qualifier. Given how close their first game against Afghanistan had been in Thailand, I knew this would be a great matchup for both teams to put their newly-acquired knowledge to the test, regardless of who won or lost. Afghanistan ended up taking the victory – its first and only win at the tournament – and showed that they have the capacity to take their next major step forward now that they have a top-level competition under their belt. The Cambodian women, likewise, have shown everyone who’s seen them play that they are on a path to success, having reached this level even faster than the Afghans. I’m so proud of all these women for breaking down societal barriers and showing their countries – and now the world – that they’re serious and ready to play. The flight I’m on now will bring me to Juba, South Sudan, for the first time in almost two years. I’ve been looking forward to coming back to South Sudan ever since my first visit there in January 2017, but political and logistical challenges have prevented it until now. I’ve stayed in close touch with several of the players and coaches through Facebook in the meantime, and can’t wait to see them all again in person. This visit to Juba will be different from my previous one – and, indeed, different from any other coaching trip I’ve done – for one key reason. For the first time, I’ll be bringing an assistant coach with me. Soon after I returned from my last trip to South Sudan, I was contacted by Malat Wei – a top player for the Arizona Wildcats of the National Wheelchair Basketball Association’s first division and a former player in the French professional wheelchair basketball league. Malat had heard that I’d been in South Sudan, the country in which he was born, and wanted to know if I could help him realize his dream of going back to help teach his countrymen the game he’d fallen in love with as a teenage refugee living in the US. We’ve been talking ever since, and have finally reached the exciting moment where Malat – now 24 – see his home country for the first time since he left at age three, back when South Sudan wasn’t even yet its own nation. It’s going to be an emotionally overwhelming experience for both of us, I know, but I can’t wait to see Malat and the players in South Sudan work together and build a bond over the next two weeks. I’m also thrilled that my colleague, Niki Clark from the ICRC Washington D.C. communications team, is going to be there capturing all the amazing moments along the way. More to come very soon! 10 hours into a 14 hour flight from Washington DC to Addis Ababa, and we’re still excited! After we finish our training camp in Juba, Malat will head back to the US and I’ll travel on to Ethiopia, where I’ll again be conducting my second training visit . In Addis Ababa, I’ll be joined by several special guests. First, I’ll be working with the Adecco Group Foundation – the ICRC Corporate Support Group Partner which has played a huge role in enabling the expansion of the ICRC’s disability sport and inclusion program over the past year and a half – to conduct a pilot project on teaching job acquisition skills (for example, job interest identification, networking, resume writing, etc.) to athletes with physical disabilities in non-traditional economies. Additionally, I’ll be joined in Ethiopia by IWBF classification and referee trainers who will operationalize the new agreement between the ICRC and IWBF for the first time. We’ll be delivering these trainings to both Ethiopian participants and a few guest participants from surrounding countries including the Democratic Republic of the Congo (DRC), Tanzania, Rwanda and Sudan. It’s going to be a groundbreaking program on many levels. Following two weeks in Ethiopia, I’ll fly on to Lebanon, where the ICRC is partnering with the Tripoli Disabled Sports Association (TDSA) to hold the aforementioned Hanna Lahoud Cup tournament. The tournament is named after a Lebanese ICRC colleague who was tragically shot and killed earlier this year in Yemen. Hanna was an active promoter of disability inclusion initiatives and – I just learned from his wife, who is also an ICRC delegate – even regularly played wheelchair basketball with mixed teams of disabled and non-disabled players in a previous ICRC mission, so we are excited to honor his memory with our first international tournament. The five team field will include ICRC PRP-supported teams from Afghanistan, India, Iraq, Lebanon and Syria. It will be the first in what I hope will be a long run of ICRC-sponsored international tournaments held in Hanna’s honor. While I’m in South Sudan coaching with Malat, two great coaches from Canada – Joe Higgins and Fonzie To – are running a training camp for the ICRC in India to help select and prepare the Indian men’s national team for the ICRC tournament in Lebanon. I met Joe at the Asian Para Games qualifying tournament in Bangkok last March and was immediately impressed with the coaching job he did with the Hong Kong men’s team, which Fonzie plays for. I could tell he’d be a great person to lead a program with the Indian men, who are ready to take their next leap in international competition. I’ll have more to report from Joe’s and Fonzie’s experience soon. I have one last item I need to cover before I conclude this post. I lost two very important people that have played key parts in my journey the last several years. One of my oldest and closest friends – more of a brother, really – Tim Broderick, whom I’ve known since I was 18 and who was one of the first and most ardent supporters of my work to bring athletic opportunities to disabled athletes in the developing world, passed away from cancer at the age of 44 just under two weeks ago. I’ll never forget sitting with Tim, his wife Eileen, and his parents, Pat and Gale, back in the late summer of 2009, discussing the prospect I was considering of going to Afghanistan to coach a newly formed team of wheelchair basketball players. They were all nervous about my safety, but they also saw the potential in this seemingly crazy idea and were behind me and my mission from day one. Tim was a truly remarkable human being who had a profound influence on me and the life I’ve led. Just hours before I departed for Africa, I also got the devastating news that one of the players I’ve coached in Gaza for the past four years – Ahmad Dosh – suffered a traumatic brain injury due to a fall and passed away. He was a young man in his early 20s who was just beginning to realize his potential. Dosh was one of the great success stories of the wheelchair basketball program in Gaza, having gone from being a shy, introverted teenager to a core member of the Gaza national team and a person that the entire wheelchair basketball community in Gaza revered. I don’t know how long it will take for these losses to hurt less – or if they ever will – but I know I will continue to love and honor both these men for the powerful lives they led. Thank you, Tim and Dosh, for all the joy and meaning you brought to my life and to the lives of all those who were lucky enough to know you. May you both rest in peace knowing you left the world a better place for your having been in it. I spent the first half of July on the Gaza Strip. As everyone who reads or watches the news probably knows, it has been a difficult spring and early summer in Gaza. Ongoing violence along the border with Israel has led to dozens of Palestinian deaths and hundreds of disabling injuries, resulting in a massive medical crisis that the ICRC has been instrumental in helping to navigate. Even in the most difficult period of violence since the last war with Israel in 2014, however, I hoped that wheelchair basketball would provide a much-needed positive diversion for Gaza’s (growing) population of physically disabled athletes. It was my fourth year in a row visiting Gaza – at this point one of the most well-established disability sport programs supported by the ICRC – but my first in my role as the ICRC’s Disability Sport & Inclusion Advisor. This, combined with the developing maturity of the program, meant that I would take a different approach than I have in my previous visits; instead of focusing primarily on coaching players and training coaches, referees and classifiers, I would spend a good deal of my time meeting with colleagues throughout the ICRC and potential partners in outside organizations to see how we can expand opportunities for persons with physical disabilities in broader society, not just on the basketball court. I was excited to work again with my longtime colleague, Ahmed Mosa, who has been a key part of the ICRC’s Physical Rehabilitation Program (PRP) in Gaza for over a decade and who was recently promoted to head the program – the first local staff person to have achieved this level of seniority in the PRP. Ahmed has been instrumental in developing the sport program in Gaza and I knew he and the Gaza arm of the Palestinian Paralympic Committee (PPC) would be excited to show me the progress the sport and inclusion program had made since my last visit in June of 2017. For the past three years, the PPC and the ICRC have worked together to hold a multi-month league for wheelchair basketball in Gaza. This would be the first year I would be able to time my visit with the competition, so it was also a great opportunity for me to see all the pieces we’d been building in action. The more I could help the referees polish their accuracy, assist the coaches in understanding the basics of tactical preparation and in-game adjustments, build the classifiers’ confidence in their ability to analyze and categorize players, and develop the administrative efficiency of the league commissioners, the faster and more sustainably the league would be able to grow. I was very impressed with the two days of league competition I was able to witness. The players and coaches are gradually making strides and it’s clear that those who have decided to commit themselves to practicing and learning the game the way they know it should be played are making tremendous progress. There is a bit of a disparity beginning to form between those who are doing their own research on ways to get better and those who are waiting to be taught, but I hope this will be a motivating factor for everyone as they strive to keep up with the development of the early leaders. The referees, classifiers and administrators had all done a fantastic job learning the finer points of their roles since my last visit as well. The fact that so many members of the able-bodied basketball community (including coaches) have been open to bringing their experience to the wheelchair game in Gaza has been a huge boon to the sport. FIBA-licensed referees and table officials have learned the wheelchair rules quickly and brought an aura of professionalism to the league. One of the most exciting basketball stories I saw in Gaza was the progress by the newest women’s team – hosted by the Farasat Club for Women with Disabilities – which had just been formed a year ago. When I met with them in 2017, the players were just learning to move their sport wheelchairs (very slowly at the time) and only a few had the strength to get the basketball anywhere near the goal. They have been working very hard to catch up with the more experienced clubs, however, as has been evidenced in their club manager’s regular social media video posts of their training sessions. In their first game of the league season, they matched up with one of the two longest-tenured women’s teams and served notice to the entire league that they were ready to play for real, winning the game 14-0! It was an unbelievable performance and the team couldn’t stop smiling, cheering, or taking group photos after it was over. Following my observation of the varying levels of understanding and skill from team to team, I brought all the coaches together to encourage them to work as a community, sharing knowledge and effective training techniques so that wheelchair basketball across Gaza will rise to the next level. It was something I don’t think they had considered before, thinking that – since these are their opponents – they shouldn’t be collaborating, lest they give away a competitive advantage. I explained that, as a developing program, they all need to be willing to ask for help when they want to find new ways to spur their teams to improve and, at the same time, be willing to share innovative and effective techniques so that all of them can grow together. This will create greater parity across the men’s and women’s leagues and will see all the teams accelerate their development. By the end of the meeting, everyone seemed to be on board and ready to take this new approach. While the basketball program showed off its progress, I also got to see some exciting possibilities for developments off the court. First, I visited the newest sports initiative in Gaza for persons with disabilities – its first amputee soccer team. The team is based in Deir Al-Balah in the middle area of Gaza and was just formed a few months ago. They already have committed coaches and administrators as well as the first small group of players. Everyone is very excited for the program to take the next step and begin forming an amputee soccer league with teams across the Strip, just like we have for wheelchair basketball. Given the passion for soccer in Gaza and the number of amputees across the area, I know this sport has the potential to become huge – they’re even already getting interest from international media! I’ve already started putting out feelers to international experts in the sport to see how we can help them move the program forward in Gaza. With my ICRC and PPC colleagues, I also had the chance to meet with deans of Al Aqsa University – the largest institution of higher education in Gaza – about expanding their college of sport education to incorporate adaptive sports. Their staff was very open and excited about this idea, and I’m looking forward to working with them to implement it for the first time. We also visited a mental health facility in the south of Gaza where an innovative project called “Healing the Wounds” is helping people who have lost limbs to cope with their physical change and reintegrate themselves into society. The ICRC’s Mental Health & Psychosocial Support team has played an instrumental role in this ongoing project, and there are exciting opportunities for the PRP to get involved and promote employment and educational growth for persons with physical disabilities as well. Along similar lines, Ahmed and I had productive discussions with the ICRC’s Economic Security team about instituting projects that will promote access to employment and other forms of inclusion in the coming year. Seeing this type of potential for opening up new opportunities for disabled athletes (and non-athletes) is extremely promising, and I’m looking forward to seeing them move toward implementation through the rest of the year. Two other exciting inclusion efforts I was able to see were promoted by the Peace Club for People with Disabilities – one of the clubs that sponsors men’s and women’s wheelchair basketball teams in Gaza. The first of these projects was very basketball-specific. The Club applied for a grant to build a gymnasium around its outdoor court – very similar to the project undertaken by the ICRC in Kabul, Afghanistan several years ago to build the gym that now hosts every Afghan national championship tournament – in order to allow players from its club and any other to practice year-round. The project is nearing completion and is going to be wonderful when it’s done. Instead of having to plead for court time in one of the few gymnasiums around Gaza, the wheelchair basketball community will now have one all its own. As amazing as the gym will be, the second inclusion project underway through the Peace Club is even more revolutionary. They are working with engineers from Humanity and Inclusion (HI) to make a section of the beach in Central Gaza City fully wheelchair accessible. This will be the first time any portion of the Mediterranean Coast in Gaza can be accessed by wheelchair users. It will include a large ramp leading all the way across the beach from the main road to the water, an accessible parking lot, a half basketball court specifically for wheelchair players to show their skills to the public, and a café serving anyone, but staffed by persons with physical disabilities. I saw it about halfway to completion and it is going to be truly incredible. It’s unlike anything I’ve seen anywhere in the world in terms of the unrestricted access it will give people with mobility impairments to all levels of the beach. While I was visiting the beach construction site, I was greeted by one of the wheelchair basketball players, Tota, who told me he had prepared a present for me near the sea. I knew Tota was a beach artist who makes three dimensional sculptures based on Arabic script, so I was curious to see what he’d created. Because the wheelchair ramp hasn’t been completed that far yet, we had to get creative about getting me across the deep, soft sand to the water’s edge. First we tried driving the ICRC Land Cruiser over the sand, but we got stuck. After having a passing tractor pull us back to firmer ground, a group of friends and random people on the beach came together to pull my very-beach-unfriendly wheelchair through the sand to the site of Tota’s gift. When I got there I was stunned; written in giant, perfectly formed three dimensional letters was my name with a basketball in the center and a Palestinian flag above it. I was honored and humbled to say the least. Tota had arrived at the beach at 5am to spend four hours sculpting his creation. To make it even more special, I learned from one of my colleagues that Tota can neither write nor read Arabic, much less English. He’s just such a talented artist that he can see the printed letters and perfectly recreate them in three dimensions with sand. What an unbelievable tribute. Thank you, Tota. While my visit to Gaza was shorter than I would have liked and was surrounded by an extremely difficult political situation, it was still incredibly inspiring. I see so much potential in the strong community of persons with disabilities there and I continue to take very seriously the challenge of working with my ICRC colleagues, the PPC and others to find new ways to allow that potential to blossom.